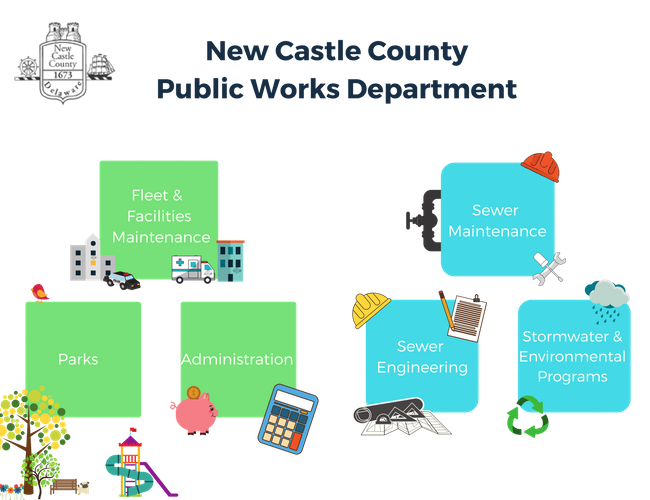 Work performed by the Department of Public Works includes the installation and maintenance of the sanitary sewer system, development and upkeep of parks and open space, and the construction and maintenance of libraries and other government buildings. Design, maintain and build sanitary sewer infrastructure and wastewater treatment facilities. The Department is responsible for operating and maintaining the New Castle County wastewater collection system. The system consists of approximately 44,000 manholes and approximately 1,764 miles of sanitary sewer gravity collection system pipes ranging from 6 inches to 84 inches in diameter. Annually respond to approximately 32,000 utility tickets; completes 1,000 service requests along with 15,000 work orders. Manage and develop parkland, open spaces, natural areas and greenways. The Department has 248 parks covering 5,686 acres of parkland in the county. Work involves mowing and trimming at all locations, athletic field maintenance, and renovations, routine and emergency tree removals, playground maintenance and monthly safety inspections, court game maintenance, and inspections, walking path maintenance, snow removal, and an assortment of similar duties to maintain assets. Implement a broad range of Environmental Control and Pollution Prevention Programs designed to preserve and enhance the groundwater and surface water quality in the County, including the NPDES stormwater program, the Industrial Pretreatment Program and the Fats, Oils, and Grease Program. Responsible for the grounds maintenance and forestry work at all facilities owned or managed by New Castle County. The inventory includes 248 parks, all County buildings, pump stations (175), treatment plants (4), and vehicles/fleet (1,118 vehicles, 700 grounds equipment). In total, the department supports and maintains 58 buildings, totaling over 1,000,000 square feet. I would like to connect to sanitary sewer, how much will it cost? Do I qualify for a residential sewer waiver? What is a capital recovery fee?